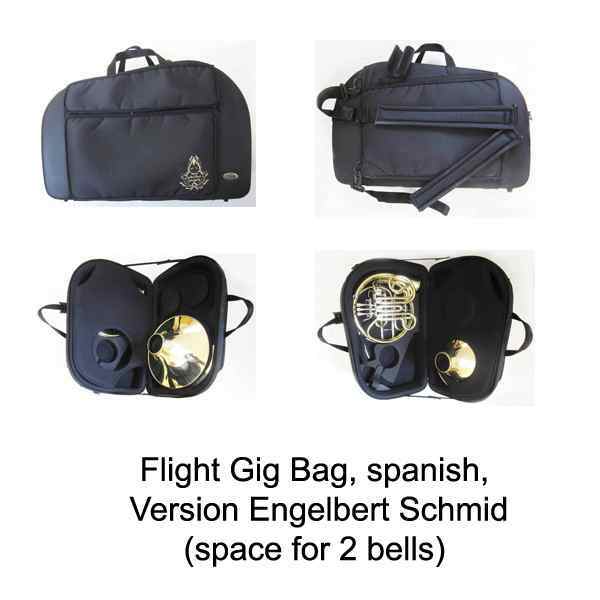 The Engelbert Schmid Vienna Horn is not a very light horn. As a Vienna Horn is a single horn, a very light weight is not as important as at the Rotary Valve Double or Triple Horns. But extremely important is to reduce the moving mass at the machine, i. e. the total weight of the levers and Pumpen Valves. Engelbert Schmid succeeded to reduce that moving mass to below 50% of the usual weight. This means that the valves are absolutely quick, there is nothing of the usual shaking of the instrument if you push the valves. Suddenly you have a technically versatile instrument, with the famous smooth slur facilities of “Wiener Pumpen”. Now the Vienna Horn can be established also as a solo instrument! We recommend 5 water keys respectively so called "tone holes". 4 of them are tone holes, which can be connected to the thumb lever. With these 4 tone holes you get all top notes absolutely securely! With the same lever connected to 3 water keys you may empty practically every water in the instrument within a few seconds. 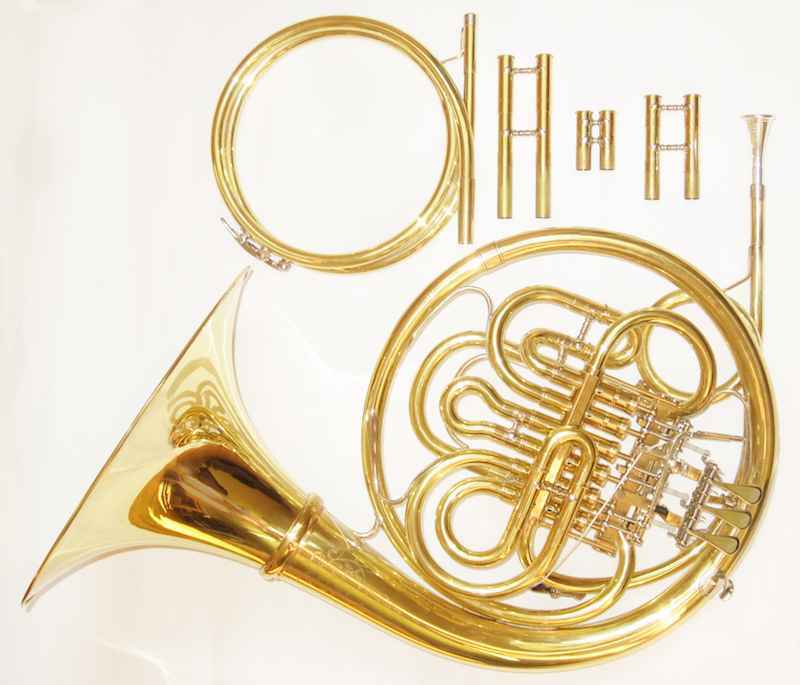 There are only healthy notes on this revolutionary Vienna Horn, the sound is typical, the intonation is ideal, and a Vienna Horn in F and a Vienna Horn in Bb. 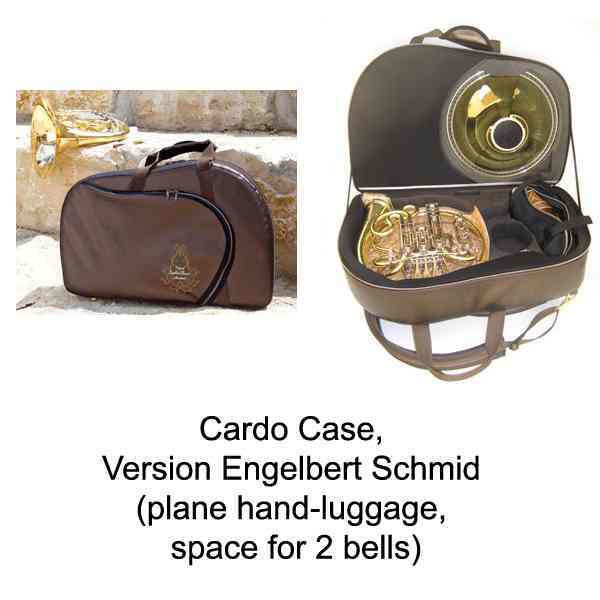 Its standard at the Vienna Horn by Engelbert Schmid, that you can convert it within a minute into a Bb Vienna Horn by taking out 3 intermediate pieces at the valve slides and using the Bb crook. By the way the lengths of the corpus, the F-crook and Bb-crook are identical to that of Vienna Classic Hand Horns. So you can use this Vienna Horn like a Hand Horn for all keys with your Hand Horn crooks. There a four widths to meet the individual lip sizes. For each rim width there are six cups,- shallow, medium shallow, medium, medium deep, deep and extra deep, in order to achieve a brighter or darker sound, an easier high register or a more voluminous low register. Usually Engelbert Schmid mouthpieces are used with the original bore. For individual needs sometimes it´s an advantage to drill out the bore for one or two tenths of a millimeter. In this case the curve of the cup has to be adjusted. The traditional mouthpiece production is done by copying a hand made example with tools that have to be repeatedly sharpened. Although the sample may be very good, it is not possible to get a perfect copy of the curvature by hand. There will also be a certain tolerance due to the necessity of repeatedly sharpening the tools. The traditional Original or Model Engelbert Schmid mouthpieces that exist since 1981 are made with utmost care from samples that were made by hand by Engelbert Schmid himself. The shaft is now a uniform taper between Morse and metric so that they fit in just about any mouthpipe. Exact geometric research show the necessity of increasing the bore by 2/10 mm at each step from shallow, through semi shallow, middle, semi deep, deep and extra deep. The future in producing the acoustically important pieces of a horn from the mouthpiece to the bell is in introducing the use of electronics. Engelbert Schmid has determined the ideal curvature for the mouthpieces 4 to 15.5. In addition the long planned mouthpieces Nr. 1 - 3.5 in the Viennese type are now ready. These funnel shaped mouthpieces are available from shallow to extra deep. Viennese mouthpieces are generally very deep. For example the Nr. 2.0 (middle for Viennese standards) is comparable to Nr. 9.0 (deep) of the German standards. For a fourth horn player outside of Vienna the Nr. 2.5 (semi deep, Viennese standard) will be deep enough. The funnel mouthpieces can be beneficial for horn players who tend to have too bright of a sound. The bore of the funnel mouthpieces are, in general, larger which can cause more noise in the sound with certain lips. The ideal curvatures have been digitalized and the mouthpieces will be produced with wear free tools so that the mouthpieces will stay the same for all time. By the way normal digital copying lathes also copy all the small imperfections in the sample and add their own. The digital production of ES mouthpieces has nothing to do with existing digital copying lathes! The rim is now perfectly comfortable, as Engelbert Schmid had always imagined it. The mouthpieces now have a uniform cup wall thickness of 1,7 mm, which has a positive influence on the way the mouthpieces vibrates. You now see from the outside the shape of the cup. The steps in the bore from shallow to deep have to increase 2/10mm. The traditional mouthpieces will also have this change. The steps in the cup depth have been evenly divided. Shallow, semi shallow, and deep are approximately the same as the traditional cup depth. Middle and semi deep were a bit deeper than logical. That means the digital mouthpieces middle and semi deep are a bit shallower than before. You may have to go one half step deeper than before to get the sound you prefer. The advantage of the digital mouthpieces lies in the increased efficiency and the ability to make perfect copies. Decide about your rim width. Listen to your sound with the medium cup, i.e. with No. 2, No. 5, No. 8, No. 11 or No. 14. If you wish a brighter sound try the next shallower cup, or if you wish a darker sound , try the next deeper cup. Usually Engelbert Schmid mouthpieces are used with the original bore. For individual needs sometimes its an advantage to drill out the bore for one or two tenths of a millimeter. In this case the curve of the cup has to be adjusted again. We describe the characzeristics of the 2 main bell sizes medium and wide. Medium (m): an elegant, clear, carrying tone has advantages in the high range over the wide bell. Wide (w): a full, but not dull, carrying sound, sonorous. With a carefull hand position, (straight and not too far out), it is possible to compensate for the disadvantages in the high range. Brass (MS): elegant, bright (nevertheless rich), smooth tone colors from sweet to extremely brassy. The alloy most versatile in sound. Those with an embouchure producing a naturally dark sound should choose brass. For approximately 80 % of hornplayers is MS the right choice. Strongly alkaline saliva can cause pitting with brass alloy. For this reason the mouthpipes on brass horns are made of nickel silver. Gold Brass (GM): a bit smoother and darker, but clear, round and rich. Not as many tone colors are possible as with brass. Some embouchures sound a bit shallow with plain brass and need gold brass. Resistant to saliva. Some prefer gold brass simply because of the noble tone color. Nickel silver (NS): contains no silver. The nickel portion of the alloy gives it its color. The sound is very dark in piano and very bright in fortissimo. Is an option only with wide and extra wide bells. In Europe the sound of nickel silver is not considered as noble as the other alloys. In America there is a tradition of nickel silver horns, but which is steadily decreasing. NS is permanently resistant to saliva. Sterling Silver (SS): contains 92.5 % pure silver, the rest is copper. Engelbert Schmid is the only one, up to now, who has been able to produce thin walled sterling silver horn bells with a width of 310 mm. The sound is especially round so that the middle size is sufficient for most horn players. Sounds noble and doesn´t get too aggressive or edgy in fortissimo. It speaks very easily in piano with a rounded sound, (ideal for lyrical passages). In fortissimo the sound stays round but is more tiring to play than the other alloys. Is resistant to saliva and the only alloy resistant to sweat. Beautiful to look at, especially with a gold brass garland. We also offer instruments with all the conical parts made of sterling silver, (mouthpipe, bell branch and bell). The cylindrical parts are made of gold brass. The alloy of the bell affects the sound characteristic to around 60 %. In other words a brass horn with a gold brass bell sounds more like a gold brass horn than a gold brass horn with a brass bell. With a weight of only 60 grams, the tastefully decorated garland from Engelbert Schmid does not deaden the sound. The garland causes a bit more resistance, and a somewhat rounder sound that gets brassy later, but more suddenly. Without the garland the transition to a brassy sound is more even. About 20 % of hornplayers sound better with the light garland from Engelbert Schmid. Of course we use a special method to keep the difference to a minimum, but it cannot be completely avoided. Our hand hammered bells are cut out of one piece of metal bent into shape and at Engelbert Schmid soldered on one seam without "Zwickel". They are then hammered into the symetrical shape. Only in the last operation are they put on the press bank and, by turning and pressing, fitted exactly to the bell form. 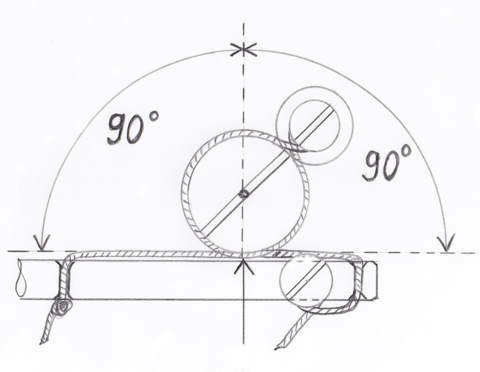 Because of the necessary stretching of the material due to the flare of the bell it becomes thinner towards the edge of the bell. At the screw ring it stays thicker than a spun bell and therefore is more resistant to sweat. Because hand hammered bells without a garland can be bent easily, you should not lift the horn by the edge of the bell. With Engelbert Schmid bells it is no problem to restabilize a bent bell edge. Stability was probably the original reason for adding garlands, not sound. Hand hammering stresses the material to a great extreme, which changes the structure, and definitely changes the sound a bit. The crucial factor is that the material becomes thinner towards the end, farther from the energy source, and therefore vibrates better with the sound. A hand hammered bell sounds more old fashioned, darker, than a spun bell. The thin end of the bell produces a very warm center to the tone in piano, and at the same time a more pleasant brassiness in fortissimo. The hand hammered bells are available with or without garland. As far as I know, we are the only ones to offer so thin a bell with a width of 310 mm. Even an increased thickness of 0.05 mm makes the instrument harder to play and less flexible. A hand hammered bell must be very thin. Just about everyone who has a chance to compare prefers the hand hammered bell to the spun one. The fixed bell is esthetically preferable, but is much harder to transport, is harder to repair, and robs the hornplayer of the possibility of changing the sound with different sizes of bells. There is almost no difference in sound because the hand dampens the vibrations in the area of the screw ring anyhow. Our screw ring weighs only 100 g and still is very stabil. It is not possible to say that lacquer does not affect the sound. With a thickness on the inside and outside of 0.02 mm, this plastic-like covering accounts for approx. 10 % of the total material. Unlacquered sounds a bit more centered, which some people find brighter, some darker, some smoother and some harder. My observation and feeling is that lacquer dampens the high overtones, and also the extraneous noise in the sound, causes the horn to sound clearer, for some brighter, although it is acoustically darker. My experience is that the difference is minimal and that 50 % of hornplayers sound better on a lacquered instrument. The lacquer is more resistant to sweat than the metal and the horn will last longer if it is carefully polished when it is relacquered. It also prevents your hands from turning green. A shiny horn also makes a better impression on the audience. In my eyes the advantages of a lacquered horn clearly outweigh the disadvantages. The combination screw bell/lacquered sounds good, perhaps even better. It is definitely not important for a hornplayer´s tone. The deciding factor is the players concept of sound. Ball and socket action or string mechanism? Many amateures order ball and socket linkages, but almost all professionals prefer string. If you examine the mechanism the reason is clear. 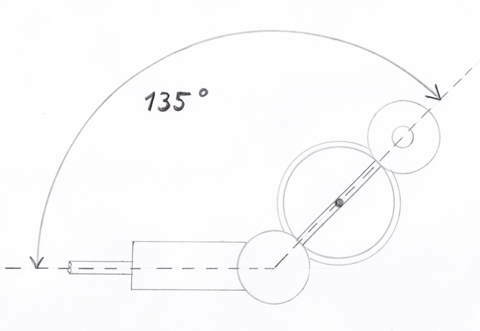 In its starting position the ball and socket action is at an angle of 135°, not really bad, but not ideal. 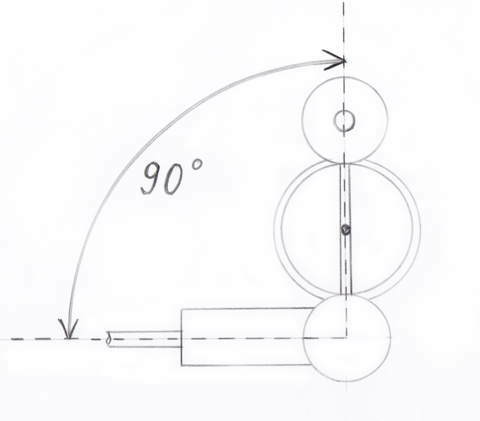 Half-way through the stroke the ball and socket reaches the optimal angle of 90 °, where the mechanical advantage is greatest. 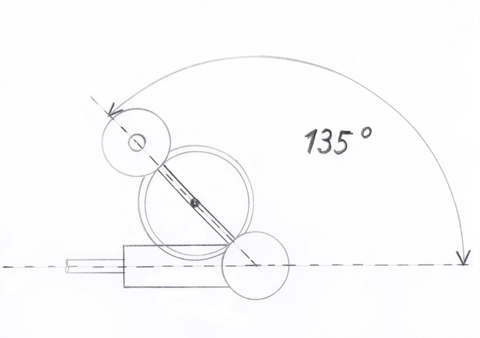 Entirely pressed, the ball reaches the less than optimal angle of °135. Since the mechanical advantage is less the rotors need more pressure to move and the stroke is uneven. Since a string action always pulls at the optimal 90° angle, the action is even and the stroke can be made very short. A ball and socket action can be made to feel more quick and even by increasing the distance between ball and centerline, but at the expense of a longer stroke. String actions have other advantages as well: They are silent and the height of the levers can be easily adjusted. Modern string materials will not break or stretch and need be replaced rarely. For those desiring mechanical action, we have chosen a very light and durable nickelplated ball and nylon socket. The light weight is especially critical when used in the long balance thumb lever of the triple horn. The Engelbert Schmid Vienna Horn is not a very light horn. 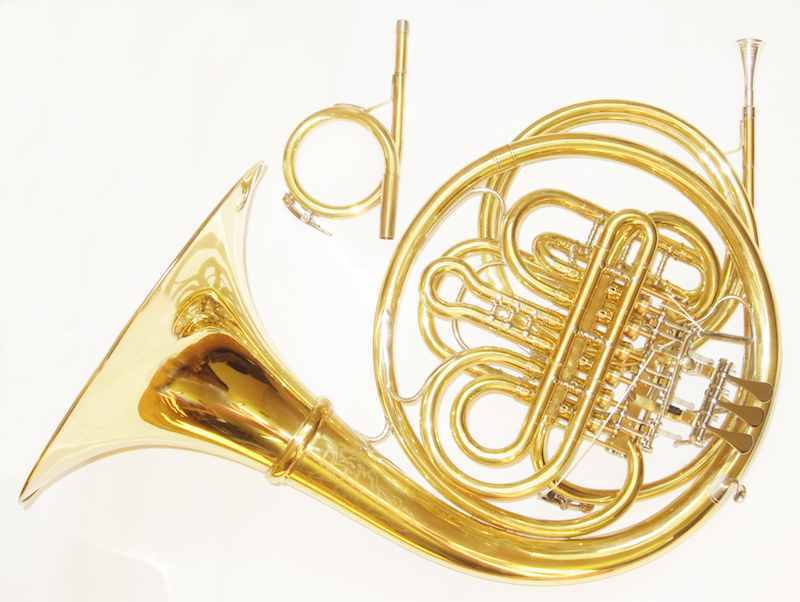 As a Vienna Horn is a single horn, a very light weight is not as important as at the Rotary Valve Double or Triple Horns. But extremely important is to reduce the moving mass at the machine, i. e. the total weight of the levers and Pumpen Valves. Engelbert Schmid succeeded to reduce that moving mass to below 50% of the usual weight. This means that the valves are absolutely quick, there is nothing of the usual shaking of the instrument if you push the valves. Suddenly you have a technically versatile instrument, with the famous smooth slur facilities of “Wiener Pumpen”. Now the Vienna Horn can be established also as a solo instrument! We recommend 5 water keys respectively so called "tone holes". 4 of them are tone holes, which can be connected to the thumb lever. With these 4 tone holes you get all top notes absolutely secure! With the same lever connected to 3 water keys you may empty practically all the water in the instrument within a few seconds. A Vienna Horn in F and a Vienna Horn in Bb. 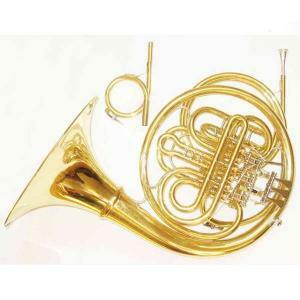 Its standard at the Vienna Horn by Engelbert Schmid, that you can convert it within a minute into a Bb Vienna Horn by taking out 3 intermediate pieces at the valve slides and using the Bb crook. By the way the lengths of the corpus, the F-crook and Bb-crook are identical to that of Vienna Classic Hand Horns. So you can use this Vienna Horn like a Hand Horn for all keys with your Hand Horn crooks.